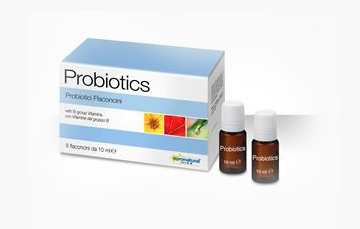 A probiotic dietary supplement with a base of Lactic Ferments, Group B vitamins and the prebiotic fiber Litesse, a well tolerated, soluble, vegetal polydextrose fiber effective in gut rebalancing. It may help particularly after episodes of diarrhoea and dyspepsia caused by changes in bacterial flora, antibiotic therapies, stress associated with a poor and hurries daily diet. It’s useful in performing a natural soothing and antispasmodic action while aiding in restoring healthy intestinal functions. The recommended dose is 1 vial per day away from the main meals.